The cupcake with something classic, something new and something pink. The big surprise here is the frosting. 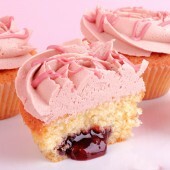 It has a milk-sour taste, thanks to the sour cream and the special Ruby chocolate. The newest type of chocolate recently developed by Barry Callebaut owes its pink colour to a special technology in the processing of Ruby cocoa beans without any artificial flavours and colour additives. 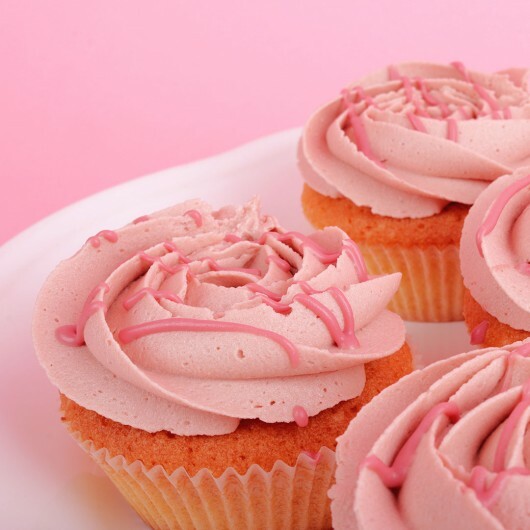 It gives a completely natural light pink color and a playful, acidic touch to this less sweet, very fluffy and fresh frosting. Your favorite Vanilla Cupcake from fluffy, creamy batter, mixed and baked immediately in our bakeries, also has something new – a heart of sweet forest berry jam. 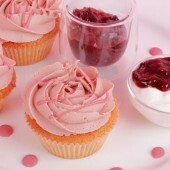 It gives a dense and juicy sound to the finished pastry through the baking process. The finishing touch are a few strokes of Ruby chocolate. Ingredients: Cow's butter, ruby chocolate, eggs, white sugar, white wheat flour, wild berrys jam, sour cream, powdered sugar, cream cheese, cow's milk, baking powder, vanilla extract, salt.